It is no secret that the renewable energy sector is growing bigger every year because we are trying to diminish the effects of climate change. According to experts, we are slowly running out of time and we should increase our efforts to save the planet by a large margin if we want our great-grandchildren to live to see the change. 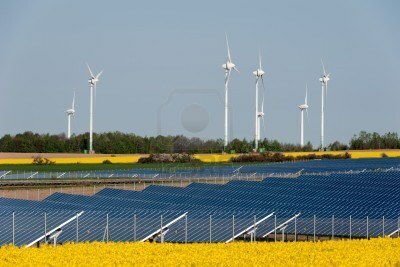 All this just depicts the bright future green energy companies should have. Hence, now may be the perfect time to acquire some of the 5 most popular green energy stocks among hedge funds. Think of it this way, not only that investing in green energy companies benefits our planet, but it also has enormous profit potential for you. Intergovernmental Panel on Climate Change predicts that carbon emissions will have to be halved by 2030 in order to avoid having more expenses to deal with the same problem. In other words, the faster we act upon it, the less we will have to pay. According to International Energy Agency (IEA), through 2050 global spending on lowering carbon emissions may reach $1 trillion on average annually, from $400 billion annually, which is the current spending. IEA also estimates that renewable energy will account for 40% of global power generation by 2040. When it comes to the portion of electricity produced by renewables around the world, it is expected to increase considerably fast in the next couple of years. In France, they are already setting up solar roads, and Japan plans to follow this trend ahead of the 2020 Olympic Summer Games that are going to be held in Tokyo. We just hit the iceberg of the climate change issues because of which green energy stocks are going to thrive in the near future. Hence, now, may be a good time to take a look at those companies that represent an attractive investment opportunity. According to Insider Monkey’s hedge fund database, here are the 5 most popular green energy stocks among hedge funds. The fifth most popular green energy stock among hedge funds in our database is TPI Composites Inc, which had 17 investors with long positions at the end of the third quarter. It has experienced a small increase having 16 smart money investors by its side at the end of the previous quarter. TRI Composites Inc belongs to the wind industry, being the biggest US-based producer of composite wind blades. Over the past 17 years, the company has produced more than 43,000 wind blades with a fantastic field performance record. According to the company’s third quarter financial results report, it had net sales for the quarter of $255.0 million, compared to $263.5 million in the same period in 2017. It also disclosed a net income of $9.5 million, compared to $21.7 million in Q3 2017, and diluted earnings per share of $0.26, versus $0.62 in the same period in 2017. TRI Composites Inc has a market cap of $835.86 million; on a year-to-date basis, its stock gained 17.74% and it is currently trading at $24.56. Two green energy stocks had the same number of bullish investors in the third quarter, 19 to be precise, and those two companies are Covanta Holding Corp and Enphase Energy Inc. Covanta has seen an increase of 5 in the number of investors with long positions in the recent period, whereas Enphase Energy has gained 1 more investor with a long position in the third quarter. Covanta Holding is a big global corporation that offers a broad range of waste management and incineration services, having more than 70 facilities around the globe. In its third quarter 2018 financial report, it has disclosed a revenue of $456 million, compared to $429 million in the same period in 2017, and a net loss of $27 million, versus a net income of $15 million in the same quarter in 2017. It has also reported a loss per share of $0.21 versus an EPS of $0.11 in Q3 2017. Over the past 12 months, the company stock lost 8.57%, and at the moment of writing, it is trading at $15.04. Covanta Holdings has a market cap of $1.91 billion. Enphase Energy is a Fremont-based company that produces a variety of software-driven home energy solutions covering the home energy storage and solar generation among others. For the third quarter ended on September 30, 2018, the company disclosed a net loss of $3.47 million, compared to a net loss of $6.85 million for the quarter ended on September 30, 2017. It has also reported a Basic loss per share of $0.03, versus a loss per share of $0.08 in Q3 2017. The company’s market cap is of $589 million, and in the last six months, its stock lost 7.87%, and it is now trading at $5.62. 20 smart money investors from Insider Monkey’s database were bullish on Atlantica Yield at the end of the third quarter, up by 1 from Q2 2018. Atlantica Yield is a sustainable total return company that runs a diversified portfolio of contracted renewable energy, electric transmission, water, and power generation assets. For the third quarter 2018, Atlantica Yield disclosed a revenue of $323.8 million, compared to $292 million in the third quarter of 2017. Over the last 12 months, Atlantica Yield’s stock lost 5.72%, hence it is currently trading at $19.94. The company has a market cap of $1.97 billion. Renewable Energy Group Inc. is the second most attractive green energy stock in our database, and also the company which has experienced the largest increase in the number of bullish investors among the stocks on this list. The company had 21 smart money investors with long holdings at the end of the third quarter, up from 13 in Q2 2018. Renewable Energy Group is a company that produces biomass-based diesel, develops renewable chemicals, and provides a plethora of green services. This is North America’s biggest manufacturer of advanced biofuel. In its third quarter financial report, the company reported adjusted net income of $19.8 million or $0.43 per share, compared to adjusted net loss of $15.1 million, or $0.39 per diluted share (not including allocation of the federal Biodiesel Mixture Excise Tax Credit for 2017). Since January until now, the company’s stock has gained 102.6%, and it is now trading at $24.11. It has a market cap of $902.28 million. The most popular green energy stock among hedge funds in Insider Monkey’s table is NextEra Energy, which had 32 bullish hedge funds on September 30, up by 1 from the previous quarter. NextEra Energy is a Fortune 200 energy company that provides energy-related services and products. One of its many subsidiaries, NextEra Energy Resources (NEER) is one of the world’s biggest generators of renewable energy from wind and sun. For the third quarter ended on September 30, the company disclosed net income of $1.039 billion, or $2.18 per share, compared to $875 million, or $1.85 per share for the same quarter in 2017. NextEra Energy has a market cap of 83.95 billion, and over the past six months, its stock has gained 11.63%, hence, at the moment of writing it is trading at $179.08.